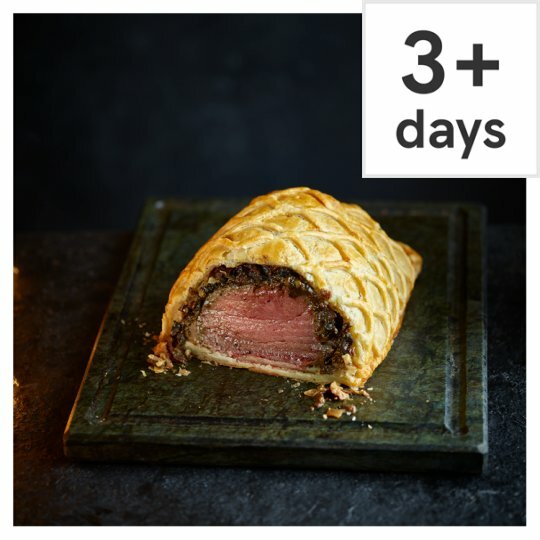 Beef fillet wrapped in a pancake with a mushroom and onion duxelle, encased in all butter puff pastry. We source our Tesco Finest Aberdeen Angus beef from trusted British farmers who are committed to the highest standards on their farms. For added tenderness and flavour, we mature these cuts on the bone for 28 days. To keep the juices in the meat and the pastry crisp and golden, we carefully wrap the fillet in a thin pancake. This product is part of the Tesco Festive Food to Order range. In order for us to get it to you in time for your delivery or Click+Collect slot, please check out by 11.45pm on 14 December. Beyond this point, Festive Food to Order products cannot be changed, but non Festive Food to order products can still be amended. INGREDIENTS: Beef (51%), Wheat Flour [Wheat Flour, Calcium Carbonate, Iron, Niacin, Thiamin], Mushroom Duxelle (11%) [Onion, Water, Whipping Cream (Milk), Roasted Mushroom, Porcini Mushroom, Butter (Milk), Closed Cup Mushroom, Chestnut Mushroom, Maize Starch, Rapeseed Oil, Madeira Wine (Sulphites), Beef Gelatine, Diced Bramley Apple, Parsley, Beef Stock, Salt, Garlic Purée, Cracked Black Pepper], Water, Butter (Milk), Wheat Flour, Fromage Frais (Milk), Pasteurised Egg, Sugar, Sunflower Oil, Salt, Lactose Reduced Whey Powder (Milk), Lemon Juice, Acidity Regulator (Citric Acid), Raising Agent (Sodium Carbonate), Stabiliser (Guar Gum), Corn Starch, Milk Proteins. Instructions: Pre-heat the oven 240°C/ Fan 220°C/ Gas 9. Place a flat baking tray (no high sided walled trays) into the oven and allow to heat up for 10-15mins. Carefully remove the wellington from the plastic container by holding the baking paper ends and place it on the hot baking tray. Glaze the wellington with egg and milk before placing in the oven to ensure a golden finish. Take care when handling the tray as it will be very hot. Place into the centre of the oven and cook for 15 minutes. Reduce temperature to 180°C/Fan 160°C/Gas 4 and cook for a further 15-20 minutes (rare) , 30 minutes (medium) or 45 minutes (well done). Remove from the oven and allow the wellington to rest for 10 minutes before serving. Rare meat will be red in the middle with some blood. Medium meat will be pink in the middle. Well done meat will be brown right through. Suitable for home freezing. Ideally freeze as soon as possible after purchase but always by 'use by' date shown.Not suitable for cooking from frozen. Defrost thoroughly for a minimum of 24 hours in the refrigerator.Once defrosted, do not refreeze. This product contains raw meat.Packaged in a protective atmosphere.Keep chilled until ready to put in the oven.